Above: Frank Shannon as Dr. Zarkov in a publicity portrait from Flash Gordon (Universal, 1936). The most unique, interesting, and memorable supporting hero of the sound serial era was the brilliant Dr. Alexis Zarkov, as played by Frank Shannon in all three of Universal Pictures’ Flash Gordon serials. 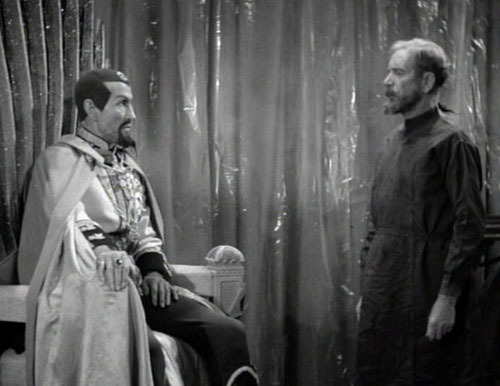 In these chapterplays, Zarkov played a much bigger role than the scientists in other serials, complementing the physical derring-do of Buster Crabbe’s Flash with mental resourcefulness, and functioning as a virtual co-hero. Shannon played the remarkable doctor with dignity, authority, and steely-eyed intensity, bringing all the gravitas of a distinguished stage-acting background to the role. Francis Connelly Shannon was born in Dublin, Ireland. Little information is available on his life in his home country, but he apparently began his acting career there. According to his co-star Buster Crabbe, Shannon was “with the Dublin Players” before coming to America; Crabbe presumably meant the famous Dublin Abbey Theater group, which was founded in 1904 when Shannon was thirty. By 1909, however, Shannon was in America, working as a stage actor in New York; he apparently appeared in a few silent films during the teens and twenties, but remained primarily a Broadway actor until the 1930s. During his time in New York, he played important roles in several popular plays, achieving his greatest critical success as Mat Burke in the original 1921 production of Eugene O’Neill’s Anna Christie. His Hollywood career, which began in earnest in 1934, was decidedly less high-profile; producers tended to typecast him as a policeman because of his strong Irish accent, and he spent most of the 1930s playing small roles as cops in both A-films (the James Cagney vehicle G-Men) and B-films (Warner Brothers’ “Torchy Blane” mystery series, which featured him in a recurring part as a police captain). He occasionally departed from police roles to play character parts in Westerns, both solid citizens (End of the Trail, The Texas Rangers) and villains (the Hopalong Cassidy film The Eagle’s Brood). In 1936, he won the only co-starring role of his Hollywood career when Universal signed him to play Dr. Zarkov in their serial adaptation of Alex Raymond’s Flash Gordon comic strip. As the Flash Gordon serial began, a mystery planet was on a collision course with the Earth, and only one man–the supposed crackpot Dr. Zarkov–had a plan for saving the world. Enlisting the aid of young athlete Flash Gordon, who escaped a plane crash near Zarkov’s laboratory, the intrepid scientist flew a rocket ship to the oncoming planet hoping to find a way of averting the collision. Once on the planet (named Mongo), Zarkov, Flash, and Flash’s fellow passenger Dale Arden (Jean Rogers) found themselves battling the evil Emperor Ming (Charles Middleton), who planned to destroy and/or conquer the Earth and soon made up his mind to marry Dale as well. Flash spent the serial battling Ming’s machinations and protecting Dale from various threats, while Zarkov cagily worked against Ming in the Emperor’s own laboratory and continually devised strategies and scientific devices to save his fellow Earthlings from peril. Colorful and imaginative, Flash Gordon has remained the most popular of all sound serials, and Shannon’s performance was one of the many factors that helped to make it so. Whether he was confronting outer-space tyrants like Ming or King Vultan of the Hawkmen or explaining impossible technology to Flash and Dale, Shannon was so earnest and convincing that he aided audiences’ suspension of disbelief immeasurably. 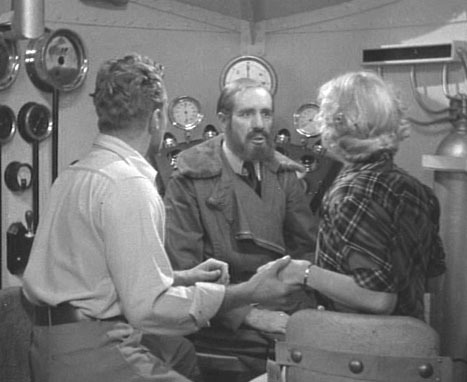 Above: Frank Shannon describes his plans to Buster Crabbe and Jean Rogers before takeoff in Flash Gordon (Universal, 1936). 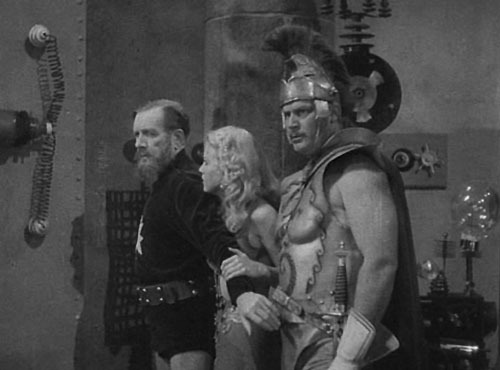 Above: Frank Shannon prepares to rescue an off-screen Buster Crabbe by turning him invisible, while Jean Rogers and Richard Alexander look on in concern in Flash Gordon. 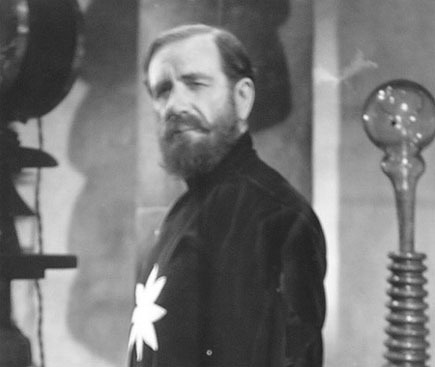 Shannon spent 1937 appearing in the Torchy Blane films and playing bits in other features, but returned to the role of Dr. Zarkov in 1938 in Flash Gordon’s Trip to Mars. This followup serial had Flash, Dale, and Zarkov rocketing to the Red Planet to thwart an exiled Ming’s attempt to destroy the earth by draining the “nitron” from the planet’s atmosphere. Trip to Mars was just as good as its predecessor, although Shannon’s role was not quite as strong as in the earlier serial. Zarkov participated in most of the action, but he largely ceded his position as the heroes’ chief strategist to Flash, who was written as a much more savvy character this time around. Shannon still got some memorable moments of his own, however, lending complete credibility to Zarkov’s snap identification of a hypnotic Martian gas and his amazingly quick creation of a powerful paralyzer ray from scratch. 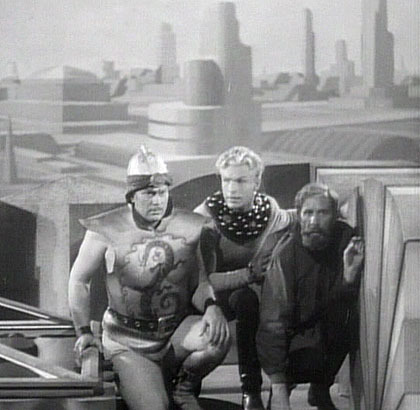 Above: Richard Alexander, Buster Crabbe, and Frank Shannon make a rooftop escape from Ming’s laboratory in Flash Gordon’s Trip to Mars (Universal, 1938). Above: Frank Shannon explains the properties of “nitron” to Buster Crabbe in Flash Gordon’s Trip to Mars. 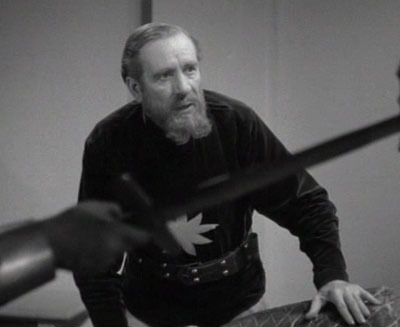 After several more character bits and multiple Torchy Blane series appearances, Shannon played Zarkov for the third and last time in Flash Gordon Conquers the Universe (Universal, 1940). This excellent conclusion to the Gordon trilogy pitted Flash and various Mongo allies against Ming in an all-out science-fiction war, and Zarkov–as the good guys’ virtual commander-in-chief–assumed much more prominence than in Flash Gordon’s Trip to Mars, devising offensive and defensive scientific plans that were executed by Flash and company. Shannon again gave the part his all, injecting a real sense of urgency into the fantastic war of gadgets. 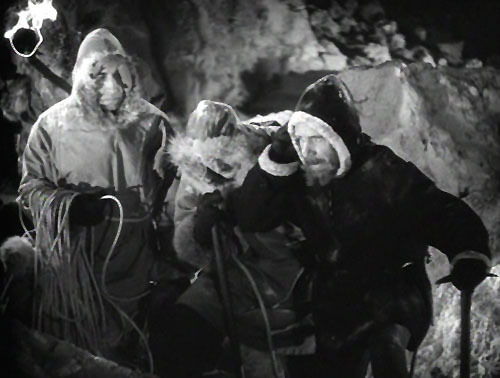 Above: Frank Shannon leads a search party through the ice caves of Frigia in Flash Gordon Conquers the Universe (Universal, 1940). 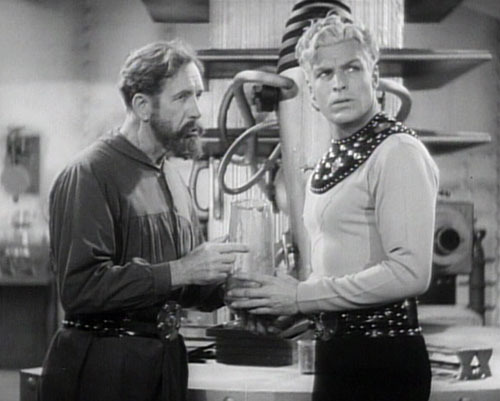 Above: Charles Middleton and Frank Shannon in Flash Gordon Conquers the Universe. After his final appearance as Zarkov, Shannon returned to the bit-player realm (the Torchy Blane series had ended in 1939). Occasionally, however, he would win a bigger role in a B-film like Universal’s John Mack Brown western Rawhide Rangers. He returned to the serial genre in 1942, playing a police commissioner in the first chapter of Columbia’s The Secret Code. Columbia’s next chapterplay, a Western called The Valley of Vanishing Men, featured him in a small but pivotal role as Henry Tolliver, father of hero Wild Bill Tolliver (Bill Elliott). Tolliver senior was a prospector and mining engineer captured and enslaved in his own mine by villain Kenneth MacDonald; his disappearance set his son looking for him and set the serial’s whole plot in motion. 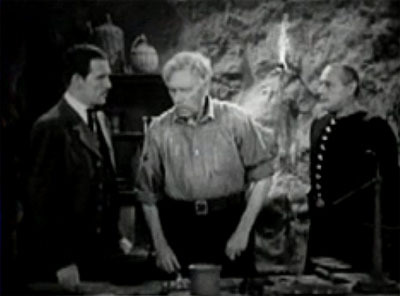 Shannon made brief periodic appearances throughout Vanishing Men, reluctantly supervising the operation of MacDonald’s mine, making a clever but thwarted escape attempt, and standing up to MacDonald’s threats with his usual dignity before being rescued in the end. Though Shannon had much less screen time here than in the Flash Gordon serials, his beleagured but resourceful character definitely echoed his Dr. Zarkov role. Above: Kenneth MacDonald, Frank Shannon, and Arno Frey in The Valley of Vanishing Men (Columbia, 1942). 1943 saw Shannon in two more Columbia chapterplayers, Batman and The Phantom. The first gave him a wordless walk-on as a scientist turned super-strong zombie who chucked Batman off a roof before plunging to his own doom, but the second gave him his last prominent screen role. 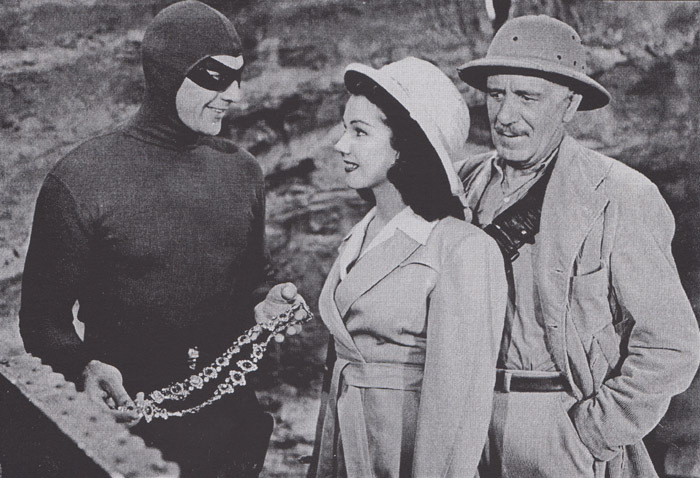 The Phantom featured Shannon as Professor Davidson, who, with his niece Diana Palmer (Jeanne Bates), led an expedition to the lost city of Zoloz. They were threatened by natives, local crooks, and spies, but were protected by the mysterious Phantom (Tom Tyler), guardian of the jungle. Davidson wasn’t nearly as prominent or distinctive a character as Zarkov had been, but Shannon made him more interesting than most serial scientists, giving added dignity and intelligence to the character. Above: Tom Tyler, Jeanne Bates, and Frank Shannon have found the treasure of Zoloz in The Phantom (Columbia, 1943). Shannon’s final serial was the Arabian Nights swashbuckler The Desert Hawk (Columbia, 1944); he had a very brief scene as a citizen lamenting the tyranny of a usurping Caliph. The remainder of the 1940s saw Shannon virtually disappear from the screen, only surfacing in an occasional bit part. If the Internet Movie Database is to believed, his final screen appearance was an uncredited bit in RKO’s 1949 crime drama A Dangerous Profession, though it’s possible he did extra work in later films. He could also have returned to stage acting, or simply have abandoned acting altogether for another profession. We do know that he was still living in Hollywood at the time of his death, which came in 1959. Frank Shannon’s screen career could easily be dismissed as an unworthy coda to his distinguished years on stage; his only large roles were in a handful of serials and B-films. However, three of those serials were among the best ever made, and Shannon’s intensely earnest performance in each of them earned him screen immortality in the eyes of serial buffs and casual film fans alike, an immortality which has outlasted that of many more prestigious and prolific actors. Above: Frank Shannon in a dramatic moment from Flash Gordon (Universal, 1936). Acknowledgements: The Buster Crabbe quote concerning Shannon comes from a 1971 interview with Crabbe published in the fourteenth issue of TEMI (Those Enduring Matinee Idols). Addendum: Through various online newspaper sources, I’ve collected several press clippings that refer to Shannon’s Broadway performances, including reviews of the original American and first English productions of Anna Christie. They can be found on this page. Thank you. As a kid I remember watching the old serials on tv. Now called media. I always wondered who the actor was that played the scientist. Now I know. A drink to a fine actor who have his best to the craft. I wonder how many kids like me got a science education because he played a believable scientist… Setting the stage also for science in latter science fiction and fact. A drink and moment of silence.